Why do Russians increasingly turn to the supernatural? Russians spend twice as much money on psychic and occult services as on medical treatment abroad. 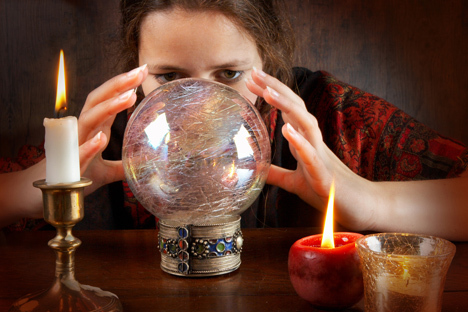 People practicing psychic readings and other supernatural activities claim that they are approached for their services by customers from all walks of life. Experts attribute this hankering for the supernatural to the desire to find easy solutions to public and personal problems. The proliferation of ads in the papers and on TV offering Russians all sorts of occult services is a little unnerving. For a modest fee, they promise to bring a cheating husband back into the fold of the family, to cure alcohol and drug addiction, to secure new heights in one's career development, to get one happily married and much else. Simply put, they offer things that are usually difficult, and sometimes downright impossible, to get through via ordinary efforts. People naively turn to these services in the hope of a miracle. The Russian Academy of Sciences has calculated that Russians spend up to $30 million a year on psychic and occult services, and only $17 million on medical treatment abroad. Olga visited a psychic on a regular basis for several years, sometimes with her mother, and once she even dragged her husband in for a consultation. She was convinced that she was getting very useful advice. Although in reality that advice often resulted in bitter marital rows. For example, once the alleged clairvoyant told Olga that she had an enemy in her mother-in-law, which immediately affected relations in the family. Olga's husband described how the so-called "psychic" would begin with making some generic statements that could easily apply to anyone and then would masterfully detect any minute changes in the person's look or expression to gauge the reaction and guess which of her statements were making an impact. With the astuteness of a professional investigator she would, over a cup of tea, quiz a customer about people in their life and them, judging by the reaction she was picking, would figure out the person's "ill-wishers." However, if a client's reaction was impossible to read, the "clairvoyant" appeared completely at a loss. For each visit she charged 100 euros. After yet another piece of advice that did not make any sense, the husband insisted that Olga stop seeing the psychic, threatening to divorce her otherwise. Tatiana was a frequent customer to fortune-tellers, usually recommended to her by her friends. However, each time she received completely different advice from them. At one of the sessions the fortune-teller was shortsighted enough to say that only Tatiana "herself could cope with her own life," and that simple psychological observation did the trick, albeit not the one presumably intended. Tatiana stopped going to fortune-tellers altogether after that. There are however other examples, too. Viktor turned to a psychic only once in his life and it, surprisingly, worked. The woman told him that he needed protection at work and promised to create this protection for him. Once Viktor, who had a senior position in a bank, fell ill and did not come into work. It was on that day that a 60 million-ruble scam was carried out at the bank, and had not Viktor been off sick on the day, he would have easily been blamed for the machination. In an interview with the SNC magazine, a second-generation psychic and parapsychologist, Sergei Shevtsov-Lang, described the occult as one of the world's most ancient and needed professions. He said that his client base had changed in recent years, with superstitious pensioners having been replaced by people in their 20s, teachers, doctors, councilors, civil servants, librarians, engineers, even police officers. The problems they come with vary from fear of the future to early alcohol addiction to complexes. Shevtsov-Lang said he had many customers among former casino owners: after gambling establishments were closed under the new laws, they tried to set up a new business, usually a restaurant, went bankrupt, took to the bottle and lost their way completely. There were also many police officers among his clientele who failed to pass the obligatory appraisal procedure that was part of the recent police reform and lost their job in the police force. Commenting on the rising popularity of the supernatural and the occult, Shevtsov-Lang said that people often came to see him "having been advised to do so by a psychologist or a doctor who had not been able to help them". According to forensic psychiatrist Mikhail Vinogradov, Communist leaders Joseph Stalin and Leonid Brezhnev resorted to psychics' services too. Whereas today's popularity of the occult is largely because of numerous TV shows in which clairvoyants, psychics and the like compete in working out various mysteries or personal tragedies, he said. "It has been scientifically proven that extrasensory perception does exist and it is being studied by scientists. For example, we have a state-funded center in St Petersburg that does research in this area. It is another thing how this phenomenon is presented and perceived,” Vinogradov said. “People in our country are beset with a growing number of social and personal problems. Men and women are trying to resolve personal difficulties by going to a fortune-teller instead of working on their problems themselves. This is a common enough thing for any unstable society, as real opportunities are being replaced with some rituals or other," he added.